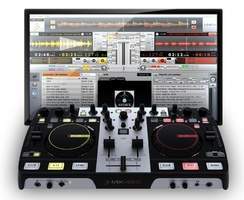 U-Mix Control Pro, MIDI Control Surface for DJ from Mixvibes. 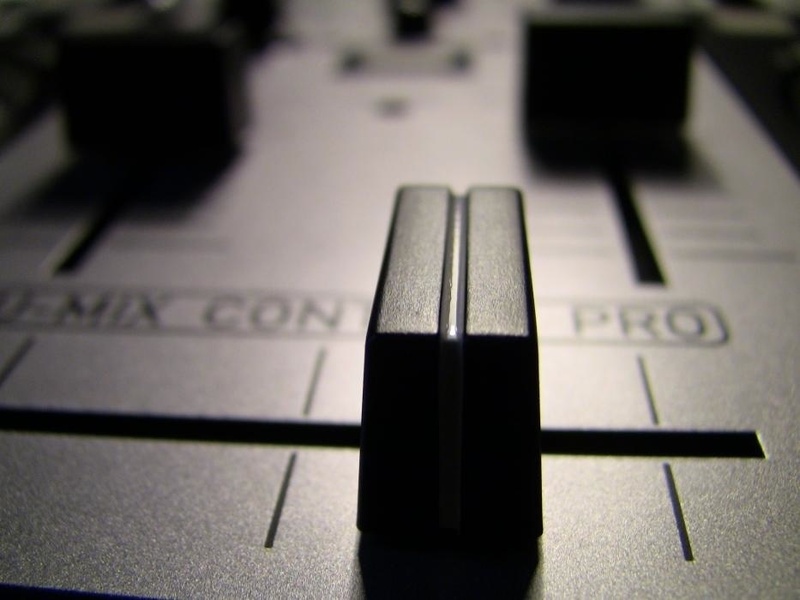 Mixvibes was founded in 2003, when they started to market a product that allowed mixing and scratching digital files using time-coded vinyl records and CDs with the use of a sound card. 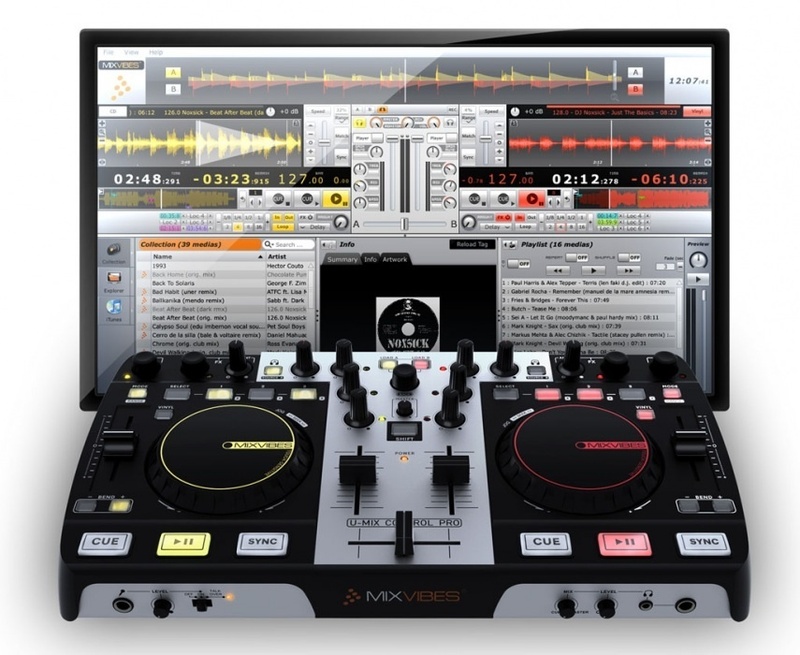 Nowadays, Mixvibes offers two products: the VFX Control, a video mixing solution, and Cross DJ, an audio mixing solution. This review refers to a bundle that includes a controller called U-Mix Control Pro and the full version of the Cross DJ software. As soon as you power on the U-Mix you will be dazzled by lots of flashing buttons that recall Knight Rider. The mixer is pretty compact (14.76" x 1.69" x 7.60") but the buttons are quite large. Only the jog wheels are really small and rather thin: it doesn't really feel like a real turntable, just in case that's what you were looking for! The controls feel a bit "plastic" but they seem to have a good quality. The faders are standard but feel somewhat stiff. On the contrary, the crossfader feels really smooth. On the front of the U-Mix you'll find a pair of 1/8" or 1/4" headphone outputs. This feature should be mandatory on all mixers to avoid problems if you lose the adapter of your headphones somewhere in your flightcase. 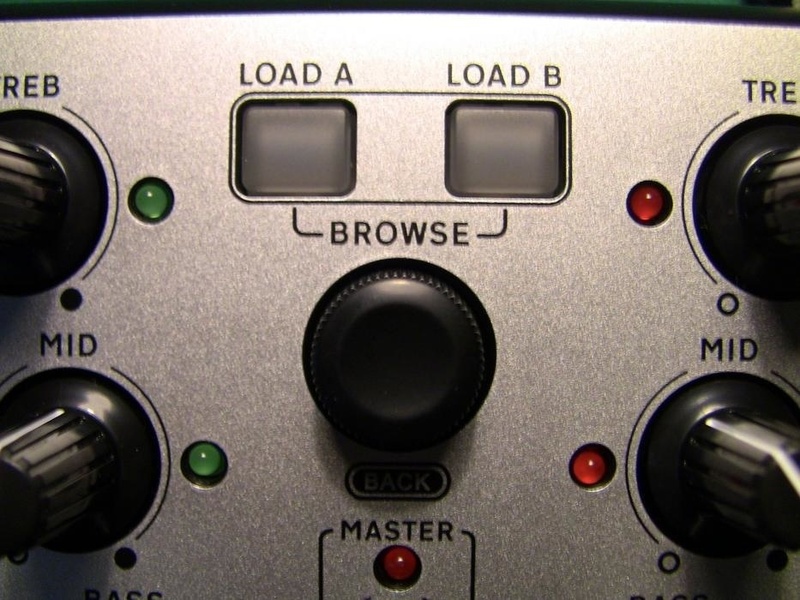 Two small controls allow you to adjust the volume and the mix. 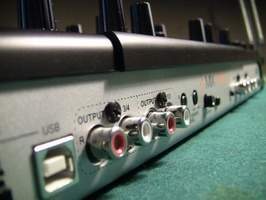 On the rear panel, the integrated sound card (48 kHz, 16 bits) provides 2 stereo inputs and outputs on RCA connectors for turntables, CD decks or external MP3 players. A small control allows you to set the crossfader curve. Note that the unit works perfectly well when powered by the USB bus, and that you can also use an optional 6V/1.5A PSU if your computer doesn't provide enough power. A small switch allows you to select the power mode (USB or external PSU). forums on the manufacturer's website. 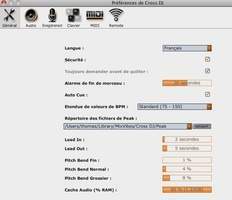 - an "audio" feature that allows you to configure the sound card used by the Cross DJ software, which can be either the sound card of the U-Mix or any other sound card. You can assign each channel of the software (Master, Cue, Direct A or Direct B) to the desired channel of the sound card. Also notice that the sound quality of the U-Mix seems to be quite good. The 8,000 files included in my library were loaded within 10 seconds. I tried to find a flaw in the system but it supports almost any file format (AAC, M4A, AIFF, WAV, MP3, FLAC, and OGG). The dock on the left is well thought-out and very useful to display information. iTunes is very well integrated but you'll have to reimport the iTunes library in every new session. The song browser is effective and will allow you to find the songs you are looking for in no time by sorting your tracks according to columns (Name, Artist, BPM, Duration, Last playing date, Playing counter, Song quality, etc.). On the other hand, the performance is not so good when it comes to BPM (Beats Per Minute) management. 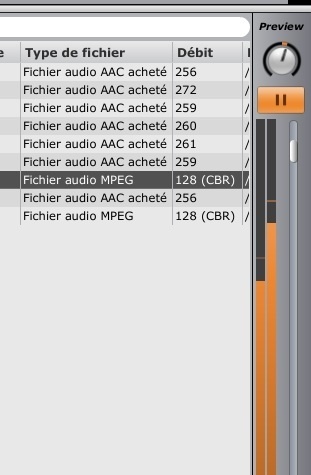 Each song can have a tag with this information, but more often than not it is not precise enough to use the feature while mixing (no decimal place). 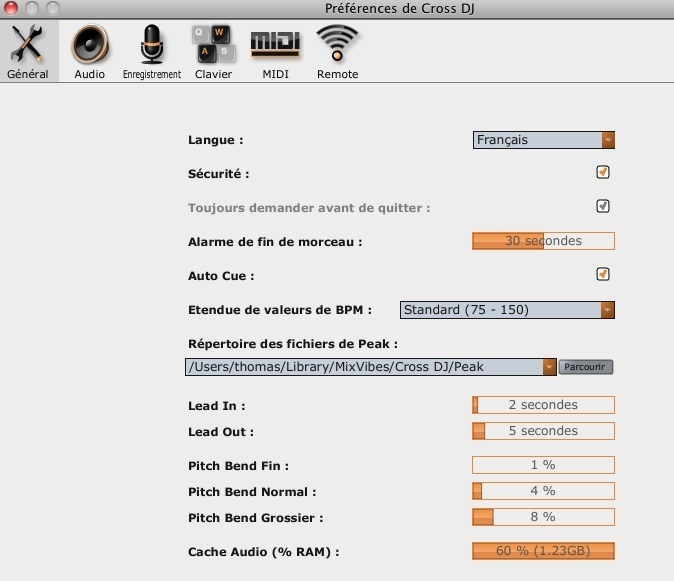 Thanks to the beat detector, Cross DJ can calculate the BPM with enough precision (two decimal places)... However, Cross DJ saves the result in the song tag but not in a separate database. And some file formats (songs bought on iTunes for example) don't allow you to change the respective tag, which makes this solution useless with such songs. On the other hand, you'll have no problems with MP3 or WAV files. A scrolling area on the top of the window provides you a visual indication to match the beat. I find this solution much less convenient than in Virtual DJ — not to say almost useless. When you try to match the beat of a song using the jog wheels, the display starts to shake and it becomes very difficult to work precisely. On the other hand, the Sync function works rather good (but the BPM must be precise: see above). Press the sync key several times to choose the most effective sync (to create syncopated offsets or to compensate an offset to match beats). A preview bar on the right of the screen allows you to monitor the song in your headphones and to freely browse the song with one click. 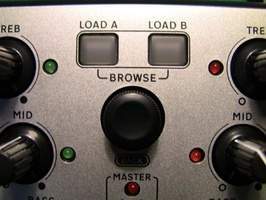 When you are looking for a song, you don't even need to push the play key because each song is played back when you select it with the rotary control in the middle of the mixer — a very practical feature indeed. This section is very simple: each player has two controls dedicated to effects: turn "Select" to pick an effect and press the control to turn it on; the second control allows you to set the value of one of the effect parameters. It is simple, straight and really effective! 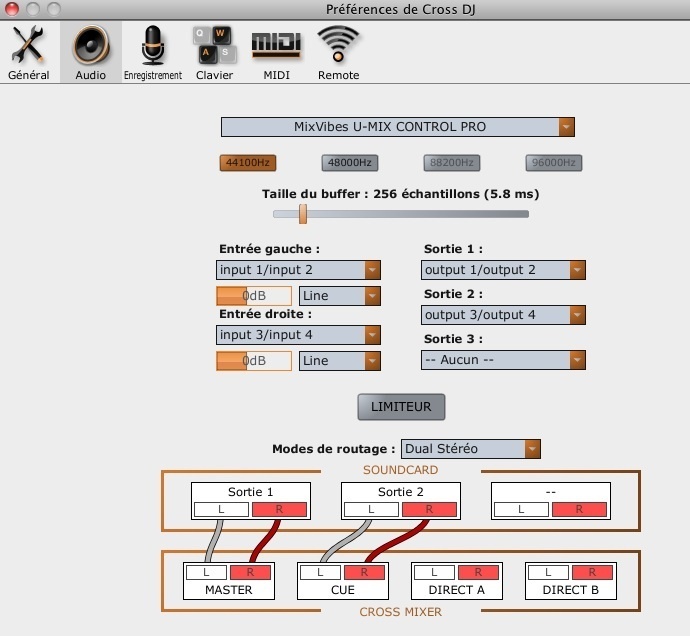 You get the following effects: delay, flanger and a high-pass in standard or "+" version. The documentation does not explain the difference between the standard and "+" versions, but the latter sounds more extreme. I'm actually a bit disappointed by the quality of the effects... As for the three-band EQ, each channel is equipped with three controls that unfortunately do not fully cut their respective frequency band (no Kill function). 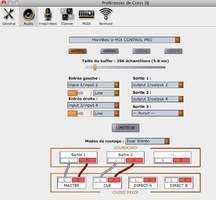 The system is also simple but practical when it comes to cue points and loops, including auto-loops you can set with an incremental rotary encoder. Click the incremental rotary control to activate the loop... Each increment allows you to create loops from 16 bars to 1/8 bar. It seems that it isn't possible to save these loops so you'll have to create them again every time. You also get six easily usable cue points: just click, it is automatically saved and the light turns on. Use shift+click to delete the cue point. In fact, you get two banks of three cue points in each player: the Select button allows you to switch between both banks... Note that the cue points are saved in the collection so you'll find them again even after you exit the software. As for the jog wheels, you can set their sensitivity, but this parameter is very fine. In scratch mode, I noticed a slight sensitivity difference when pushing the jog wheel surface, but it's almost imperceptible... I don't think this feature is very useful, but then again I'm not the best scratcher in the world... The jog wheels are precise and very responsive for mixing, considering that the USB implementation is effective and the latency is not too disturbing. 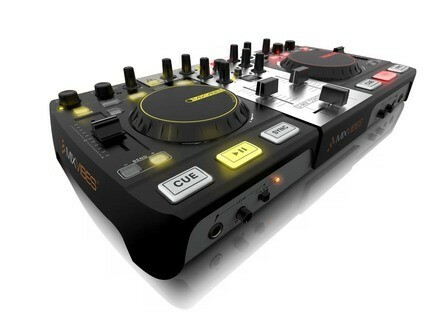 Sold for around $400 with the full version of the Croos DJ software, the U-Mix is rather attractive for people on a small budget. But don't forget that this solution is meant for DJs who don't buy songs on iTunes because of the BPM management system that makes mixing almost impossible. On the other hand, DJs working with WAV or MP3 files will have no problems. Although it was not conceived for professional DJs, the product offers a good overall quality and mobile DJs will like the mixer's compact size. Nonetheless, Mixvibes still has some homework to do, like fixing the small bugs in the software — especially considering that competitors are very aggressive in this market segment.